The Nazca Lines Flights involve a scenic tour over one of the greatest mysteries of our planet. Aerial Tour Details – Nazca Lines Flights. Our tour begins with the pick-up of our clients from their hotel in the city of Nazca. Then we drive to the local airport, which is only 5 kilometers from the city center. Upon arrival, our guide will give you a briefing about the Nazca Lines, including interesting theories. Our guide will give each passenger a Nazca Lines Map that will be very useful during the aerial tour. Before boarding the aircraft, our pilot provides safety instructions as well as tips to better enjoy the flight. We fly over the desert zone in a small plane, which has 5 seats, plus pilot and co-pilot seats. Each passenger has a seat next to the window, therefore you will enjoy a better view from the air. The flight lasts 35 minutes, time in which you will able to appreciate 12 drawings. Thus, giving passengers an equal opportunity to view each drawing through the window. Among the creatures, we will see the representation of a whale, a monkey, and a dog. Likewise, you will see various birds, such as a condor, a hummingbird, a parrot and a heron, as large as 3 soccer fields. Perhaps the most striking images of all, is the Astronaut, a strange human shape with a large head and big eyes. Unlike the other designs, the astronaut was drawn on a hillside and not on the surface, as most of the Nazca Lines. Additionally, you will see hundreds of straight lines that crisscross the desert surface in all directions. After landing at Nazca airport, our guide will take you back to your hotel. Our Nazca Lines Flights are subject to availability. 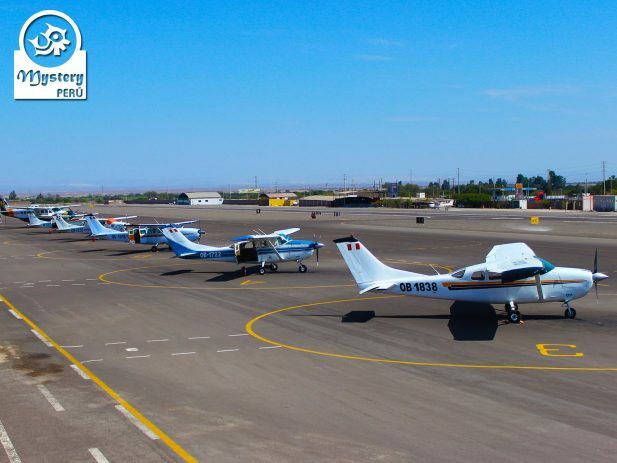 Pick up from your hotel in Nazca and transfer to the airdrome. Assistance led by an English speaking local guide.